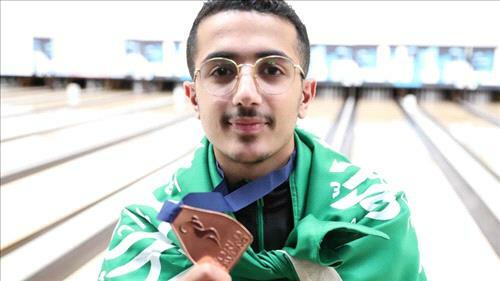 AMMONNEWS - Abdulrahman al-Kheliwi, a Saudi national team bowling player recently placed third place and won bronze at the World Youth Championship in Detroit, US, describing his win as a success and a national achievement. “I started practicing bowling since 2009. My father and the whole family supported me. Until 2013, I participated in the Asian Youth Championship. I developed myself with the trainers, and managed to be the third on the world, after a huge efforts of the Saudi Union, patience and persistence,” al-Kheliwi said in an interview with Al Arabiya English. “I did not expect to win because I was a football player. Then I became a bowling player and worked hard. I am 19 years old now. I started practicing bowling when I was 11 years old. I have many achievements at the Asian Championship and I earned a bronze medal for the general youth ranking, the bronze for youth teams, the gold in the Arab championship for the tripartite competition for men, the champion of the Arab youth championship, 4 silver and 3 bronze medals in the Gulf championship, the Arab Youth Cup and many achievements,” al-Kheliwi told Al Arabiya English. “The support of his excellency Mr. Turki al-Sheikh, the Federation President, Badr Al-Sheikh, my family and all those around me, encouraged me since my childhood, had a great impact on my achievements,” he added. “Football sport is more popular, more practiced in Saudi Arabia. We need to prove that Football is not everything and that there are capabilities in several sports which the Saudi youth can prove their excellence in, and find themselves capable to master it,” he said. Al-Kheliwi asserted that he is so happy to be on the podium at the world’s most powerful youth championships and being able to raise the flag of Saudi Arabia in this world championship is a great honor for every player. He noted that the competition is difficult in the World Youth Championship, because there are players from different schools who have high skill, methods and ways to play. Which makes it difficult for any player. We will start working immediately to achieve more positive scores with the rest of the Saudi national team players during the remaining competitions.